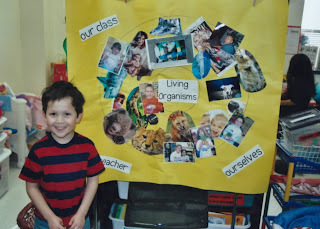 During our study of pets and animals, we learn about living organisms. We make a circle map to show all different kinds of living things. Students brings pictures of living things or real living things for show and tell. We put the pictures on our circle map. If they bring a real object then I take their picture with the object and we place it on the circle map. We always do this activity at the end of the day in case students want to bring a family member as their living organism. We read the book Quick as a Cricket by Audrey Wood. Then we compared ourselves to different animals. One of our student teachers from last year did this lesson with the students. Every year during pet week, we have a kindergarten pet show. Students can bring their pet for show and tell. We send out a very specific note about pet day. All animals must come on a leash or in a cage and with an adult. All animals must leave with the adult as soon as the show is over. We have the pet show right when school starts to make it easy on parents. I have hosted a pet show for most of my years of teaching kinder and it has always gone well. We have held it both inside and outside of the school. Our librarian brings her dog, Brinkley, for a special pet story time. Every year during pet week, Mrs. Wood brings her pet bearded dragon to school. She teaches the kids about bearded dragons and sets up a habitat for one in front of the students. All of the kids and the teachers get to hold Sunny after learning about his habitat. We wrote in our science journals about what we learned about bearded dragons and their habitats.This student wrote that they need sun light and that they eat crickets. We compare pictures of real animals to stuffed animals. This activity is a good lead in to a discussion of living and non-living. My teammate wrote animal riddles with her class. We learn about living things. We brainstorm things animals and pets need. 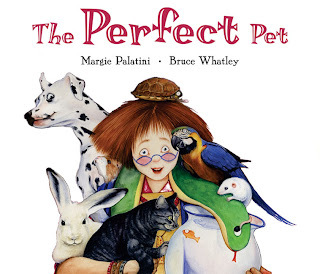 These are good books to read for a study of pets. This is the entire poem. We could have a horse for a pet. We could have a dog for a pet. We could have a cat for a pet. We could have a bird for a pet. We could have a bunny for a pet. We could have a turtle for a pet. We could have a fish for a pet. We could have a guinea pig for a pet. We could have a mouse for a pet. 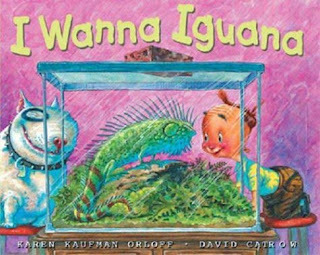 I want an iguana as a pet. A pet just for me! What pet would you like? We always end pet/animal week with Clifford Day. You can find more Clifford ideas under the Clifford Day post.